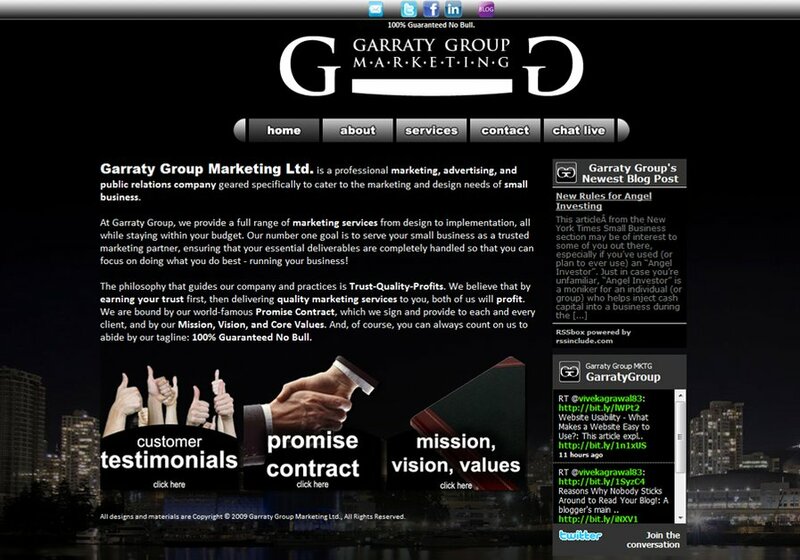 Garraty Group Marketing Ltd. is a professional marketing, advertising, and public relations company geared specifically to cater to the marketing and design needs of small business. At Garraty Group, we provide a full range of marketing services from design to implementation, all while staying within your budget. Our number one goal is to serve your small business as a trusted marketing partner, ensuring that your essential deliverables are completely handled so that you can focus on doing what you do best - running your business! The philosophy that guides our company and practices is Trust-Quality-Profits. We believe that by earning your trust first, then delivering quality marketing services to you, both of us will profit. We are bound by our world-famous Promise Contract, which we sign and provide to each and every client, and by our Mission, Vision, and Core Values. And, of course, you can always count on us to abide by our tagline: 100% Guaranteed No Bull.